There are few teams in Rugby League that can be considered consistently dominant season after season. Most seasons are conducted with incredible passion and force and followed by a slump and a bout of the ‘But, we did it last season!’ blues. Today, then, we want to bring together two of the few teams who have managed such a feat of dominance. Two who managed to keep their heads level over a stretch of more than two seasons. Come with me as I discuss the teams, the coaches and who is going to be our victor in our inaugural Fantasy Match. This Wigan squad is straight from the midst of their dominance in England. Winning 8 Challenge Cups in a row is a feat that is probably never to be replicated. Interestingly, this season was the only season they weren’t supposed to win. Dubbed ‘Mission Impossible’ by the Fans, they had to play 8 games in an 18-day period, and win. Which, in true Wigan fashion, they did. They only dropped points with a draw at Bradford. The rest, as they say, is history. Like any great team, there is always one caveat: they were the first professional team. In an era where top flight English Rugby League players were tradesmen by day and athletes at night, Wigan were devoting all their time to Rugby League. Some may call it an unfair advantage, but it helped pave the way for English Rugby League today. With all that being said, let’s take a look at the their team. 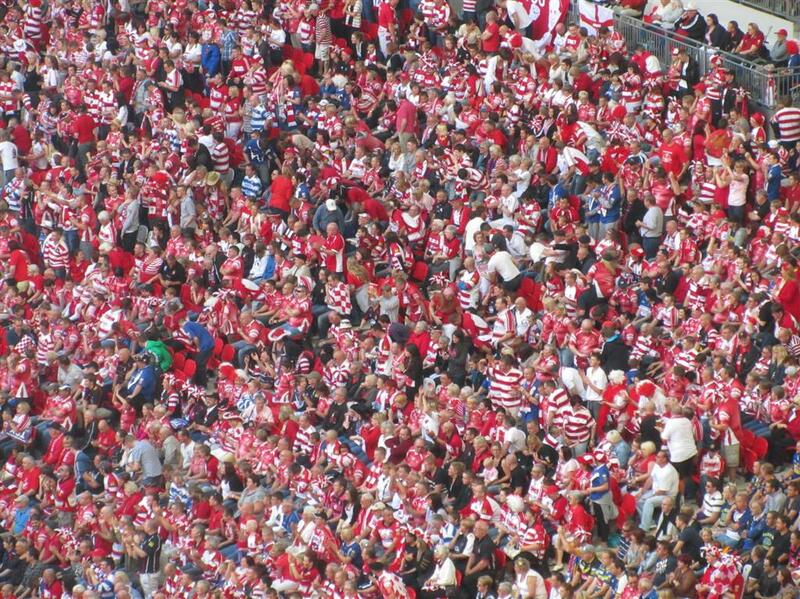 A Sea of Wigan Warriors Fans: The Glamour Club Was a Rugby League Powerhouse in the Late 80s and Early 90s. ‘The Black Pearl’ has been voted the best English Player of all time. And, with good reason – he played over 500 games, scored over 400 tries and played at the top flight for 19 years. 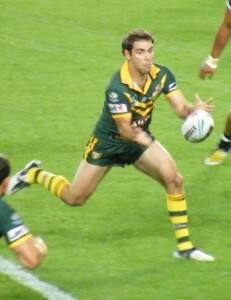 Despite being from Salford, Betts is one of Wigan’s most decorated players. He brought this squad together, playing the most games for the team throughout the season, and was awarded the Lance Todd Trophy for man-of-the-match in the Challenge Cup Final. A former All Black, Botica moved to Rugby League in 1990 and made an immediate impact for the Warriors, becoming the fastest man to accumulate 1,000 points in British Rugby League. Recipient of the Man of Steel award in 1990, Edwards was at the peak of his powers coming into the 90-91 season. The fiery half was a linchpin of the side, scoring 16 tries and laying on countless others for his teammates. Read More: Rugby League’s Greatest Test Matches. You can find a full squad listing and a breakdown of their entire season here. This team comes from right in the midst of Melbourne’s most prominent run as a premiership force. This is the season that they secured their second Premiership Title, defeating the Manly Sea Eagles in the 2007 Grand Final. They were dominant in the forwards, had one of the greatest backlines of all time and were arguably the most disciplined outfit in the NRL Premiership, dropping only 3 games all year. Again, similar to Wigan, this impeccable team has one drawback: They broke the rules by exceeding the salary cap. Melbourne has since paid the price for this and had their titles stripped from them. There are still comments of ‘buying’ titles to this day. But, this squad is one worth recognising, despite all the rigmarole surrounding it. At just 17 years of age, Folau made his debut for the Storm in 2007 and quickly established himself as a match winner. Folau was the team’s leading try-scorer, picking up 21 tries in a stunning season that culminated with selection for Australian Kangaroos. Folau’s maiden year is considered one of the best rookie seasons of all time. You can’t write about any modern Melbourne team without including Billy Slater. Slater’s 2007 season was disrupted by a fractured cheekbone, but he returned for back half of the year and was instrumental in their Grand Final success. His brilliant combination with halfback Cooper Cronk was a key feature of Melbourne’s attack. Another one of Melbourne’s long-standing players, Cam Smith had a fantastic season and was their top point-scorer once again. Smith’s influence was such that he was awarded the 2007 Golden Boot award as the best player in the world. Inglis was moved to five-eighth in 2007 and had an indifferent season by his standards, but, like any champion, he stood up when it counted, scoring a brace of tries in the Grand Final and receiving the Clive Churchill Medal for best on ground. Greg Inglis was also named in South Sydney’s Greatest XIII. This match-up makes sense for a lot of reasons: two teams in the midst of their dominance, with comments about money looming over their heads in tight seasons, looking to maintain their presence and not lose focus. Both sides boasted an array of brilliant players who produced exceptional performances. Folau’s 21-try debut season for the Storm was remarkable. Ellery Hanley’s 29-try season at Wigan was, perhaps, even more so. The Storm trio of Inglis, Smith and Slater will go down as three of the best players of all time. For Wigan, the likes of Hanley, Betts, Botica, Edwards, and Andy Gregory were all stars. It’s hard to compare these two teams on their physicality and fitness. The strength and conditioning of today’s teams is far beyond that of the early 90s. The Melbourne team was stronger, faster and more physical than any British team ever could have been back then. Although, on paper, Melbourne had the better of the two seasons, Wigan managed to win an extraordinary 17 games back-to-back. Not only did Wigan possess a squad that could have competed against any Australian club outfit – which they did, going on to beat Penrith 21-4 at Anfield a year later – they also fielded a team who performed as a well-drilled and disciplined unit. And, although there were incredible individual displays throughout the season, they always played collectively as a team. The fact that every player in the starting line-up represented at international level says it all. The Storm’s season was undoubtedly impressive. Yet, in comparison, they were still the weaker of the two teams. Melbourne played an efficient brand of Rugby League, but I feel they were, at times, too reliant on their key players. Clearly, the Storm had a crop of superstars, but at the same time, some obvious weaknesses. This isn’t just a display of English pageantry and support from myself. Au contraire, being a Salford fan means I’d love to see Wigan stuffed at every possible opportunity. But, there is a reason why people are still talking about Wigan’s eight Challenge Cups 20 years later and Melbourne’s run feels like a distant memory only a few years on. What do you think? Who would be your winner? And who would you like to see pitted against each other next week? Wigan. Best side I’ve seen.